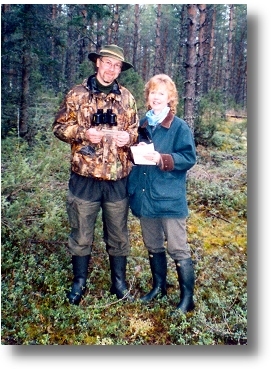 At the 'Haukkuottelu', the Finnish Spitz bird hunting trial in Finland, Angela Cavill of Toveri Finnish Spitz was presented with one of the Finnish Kennel Club's most prestigious awards, the Gold Medal. 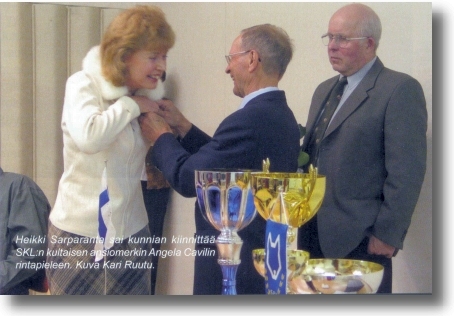 Angela, who was guest of honour at this the most important event in the Finnish Spitz calendar, was presented with the award by the famous Finnish authority on the breed, Heikki Sarparanta. 'This is a well deserved recognition of Angela Cavill's contribution to the breed' said Heikki. Angela said that while she was honoured and delighted to receive this award, especially at this event, she was aware of the debt she owes to the many who have helped and supported her over the years. In addition over the past two months Angela has achieved two ambitions in Finland. She has passed the metsastystutkinto, a formidable test, even for Finnish speakers, of hunting expertise, protocol and game preservation (a test failed by 40% of those who sit it annually!) She has also taken and passed all the tests required to become approved as a Trials Judge in Finland making her a true all-round Finnish Spitz authority. Angela is one of currently only 8 Honorary Members of the Finnish Spitz Club of Finland, which has a membership of over 5,000. 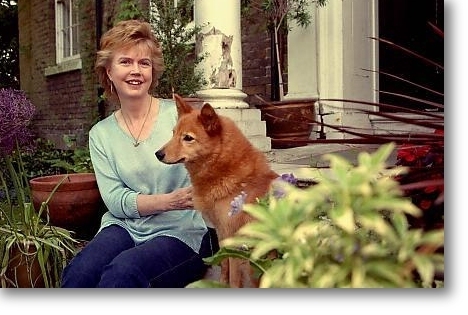 Best known in the world of dogs as Secretary of Southern Counties Canine association and a very successful breeder of Finnish Spitz, few people realise that Angela is also deeply involved in the development of cultural relations between Finland and the UK. She serves on the board of the Anglo Finnish Association and to encourage closer links between the Finnish branch of the English Speaking Union and the ESU headquarters inn London at Dartmouth House, just a few hundred yards from the Kennel Club. A fluent speaker of what is generally agreed to be the Western world's most difficult language, Angela visits Finland regularly. Her hard work has now been rewarded with the Cross of Merit of the Order of the White Cross from the President of Finland. 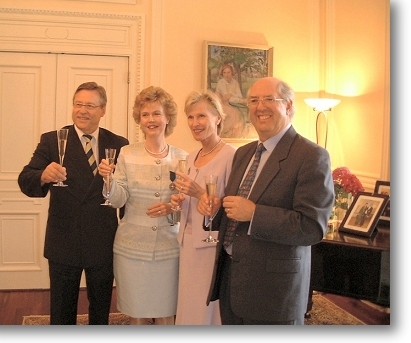 The award was made at a formal lunch held in her honour held at the Finnish Residence in London where Pertti Salolainen, the Finnish Ambassador, read out the citation and presented her with the award, a cross with a rose at its centre. The Cross of Merit' is the highest Order of the White Rose below 'Knight' so in UK terms it is equivalent to becoming a Dame. There was tremendous excitement in Finland when the award was announced. The Finnish Kennel Club devoted a page of its web site to the news and, on 2nd July, the date Angela formally received the award, she appeared, with a Finnish Spitz, of course, (Ch Toveri Pirtea) on the front page of Finland's national newspaper. In the evening she was the third item on the main national television news at 10.00 and a longer interview was broadcast on the following morning, again with a Finnish Spitz - this time Ch Toveri Armaani. Most Orders of Merit go to Finnish servicemen and women, senior civil servants and successful industrialists so it is unusual for this recognition 'for the performance of important services to Finland' to be awarded to someone without an 'official' status. In her acceptance speech, a proportion of which was in Finnish, Angela thanked her friends in Finland and the UK both at the Finnish Kennel Club and the ESU who had nominated her for the award.